Isle Royale National Park. Wolves and moose, the wild North Woods forest, ever changing weather and a cool climate, and the crystal clear waters and rugged shoreline of Lake Superior characterize Isle Royale National Park. Ninety-nine percent of the land mass is federally designated Wilderness. This wilderness archipelago is 45 miles long and nine miles wide at its widest point. The park encompasses a total area of 850 square miles including submerged lands which extends four and a half miles out into Lake Superior. The archipelago is composed of many parallel ridges resulting from ancient lava flows which were tilted and glaciated. Isle Royale has 165 miles of scenic hiking trails and 36 campgrounds for backpackers and recreational boaters. There is excellent fishing, historic lighthouses and shipwrecks, ancient copper mining sites, and plenty of spots to observe wildlife. 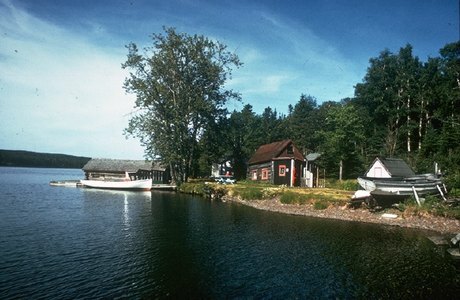 Roadless Isle Royale is accessible only by boat or float plane. Dogs, cats, and other pets are not allowed within park boundaries, which extend 4.5 miles into Lake Superior from the outermost land areas of the park. Isle Royale is relatively untouched by direct outside influences and serves as a living laboratory and is a United States Biosphere Reserve.